It has been a few weeks since I have blogged. I have been fighting a cold and couldn't train so I figured I didn't have much to tell. This week we have Black Belt John Kavanaugh from Dublin, Ireland teaching some seminars and MMA sessions at our club. I jumped in the MMA training to start and to be honest it has been some time since I have done striking, I jumped in without getting my feet wet. It was a blast. I was gun shy, but all in all, I was having a great time. I might just be inspired to have a go at MMA fighting again. I must admit, BJJ is my passion but with my wrestling skills getting sharper every day it will make me a much better cage fighter. All that talk but I am still just thinking about it. 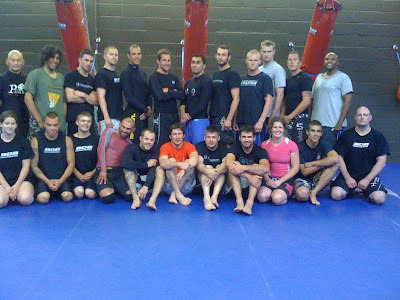 After the MMA session today was a 3 hours BJJ seminar working on guard skills. I am looking forward to doing some sparring and playing with the new information.